300,000 people, is a destination that draws visitors from around the world. Each year, the city welcomes more than a million visitors." We arrived in Anchorage yesterday at lunchtime. Within about 30 hours I've already decided this is one of my favorite cities. I'm not particularly fond of urban areas but I think this is one in which I could live (or nearby, at least). But only in the summer!! Guess that means just visiting when the weather is nice. Having a residence there and traveling to warmer climes eight or nine months of the year isn't real practical unless you already live in Alaska and want to play snowbird. We've already met several retirees who do just that. of the Signpost Forest at Watson Lake in the Yukon Territory. 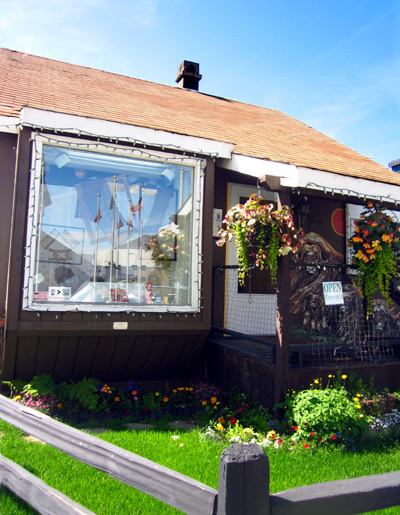 Anchorage is a diverse, thriving city that is rich in history and enjoys a wide economic base that includes more than just tourism. Other major industries are transportation, shipping, fishing, education, health care, government, retail, oil, and gas. 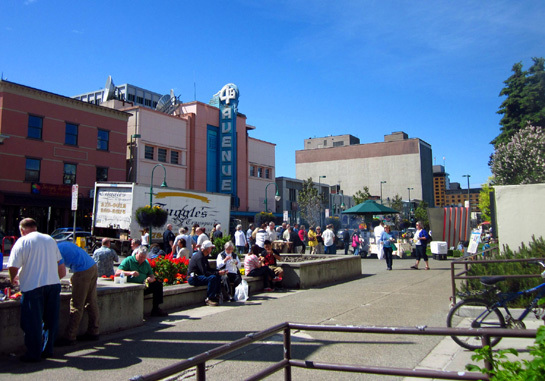 The city reportedly has a young, energetic, cosmopolitan vibe with numerous arts, entertainment, and cultural amenities. 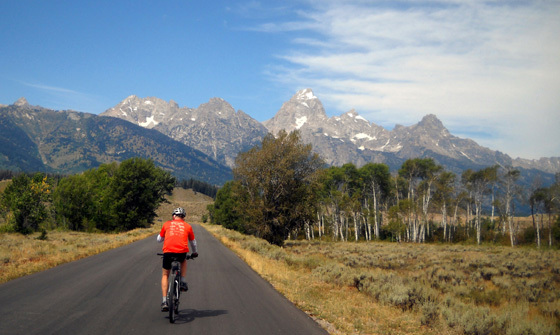 Some of that appeals to us but not nearly as much as the scenery, wildlife, and recreational opportunities that abound in and near the metro area. 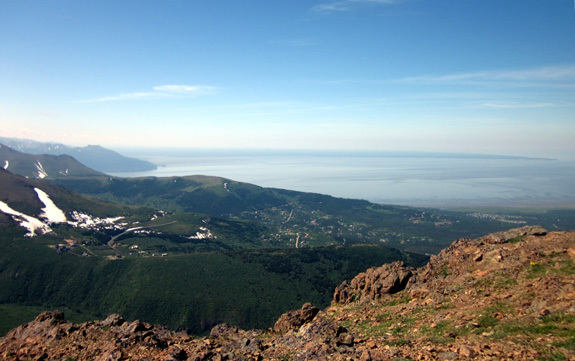 The Anchorage "bowl" is surrounded by water, forests, and six mountain ranges -- lots of Big.Wild.Life™ to enjoy. This entry covers some of the things we've learned, seen, and done in our first two days in Anchorage. There is a lot more to learn, see, and do. I'm guessing we'll be here longer than one week and I'll have plenty to share with you in this journal. We can't wait to get out and do more exploring! 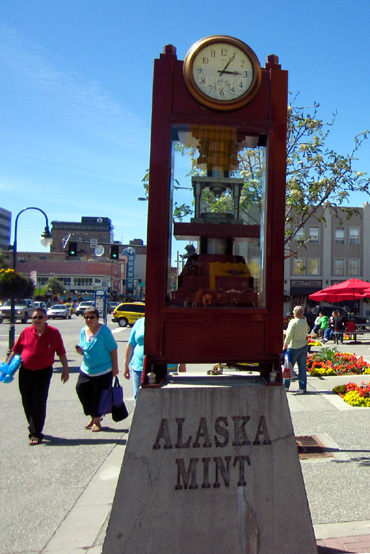 We gathered quite a bit of pertinent Alaska travel information in Tok when we entered the state last week but we needed more details pertaining to Anchorage and the surrounding area -- trail and bike path maps, for example. 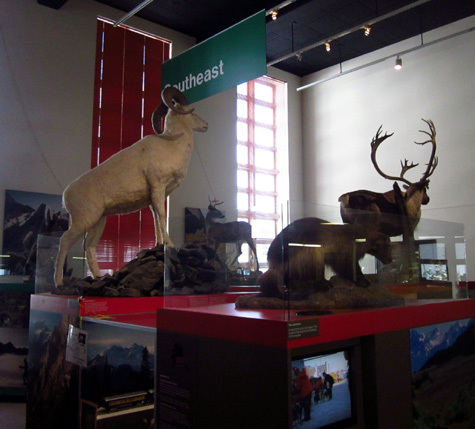 We found that and much more at the Anchorage Visitor Information Center and the Alaska Public Lands Information Center downtown. 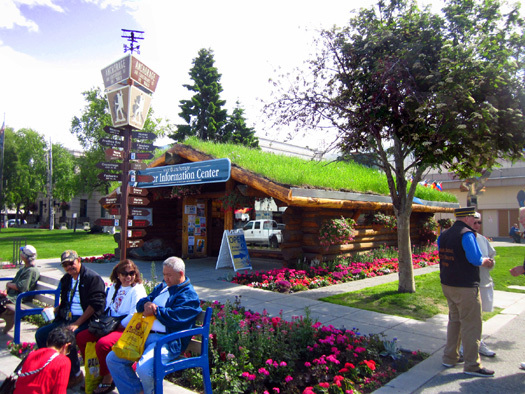 Let's start with the city's visitor center at the southeast corner of 4th Avenue and F Street. 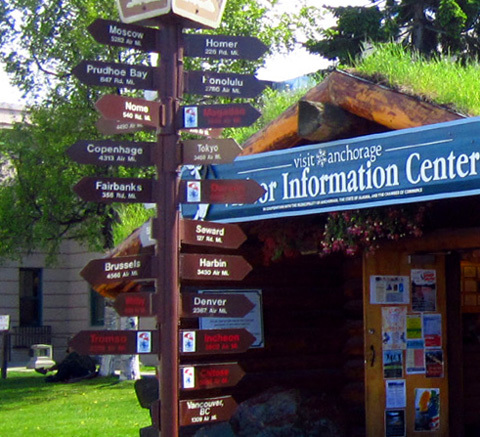 Actually, there are two visitor information centers here, both run by the Anchorage Convention & Visitor's Bureau. I think they must have outgrown the first visitor center and had to add a second one (?). 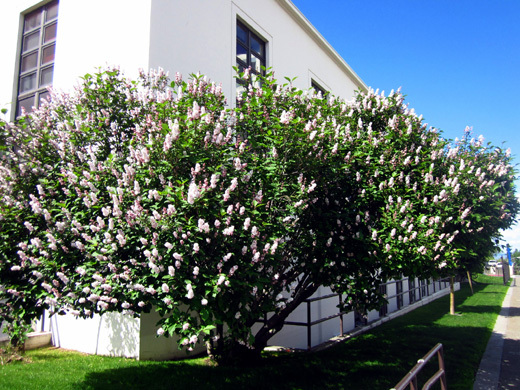 The centers are open year-round except for major holidays. Hours vary by the season. A trolley ride might be a good way to see some of the city highlights if there are narrated tours. Some appeared to be residents just hanging out. Others were more obviously tourists like us. 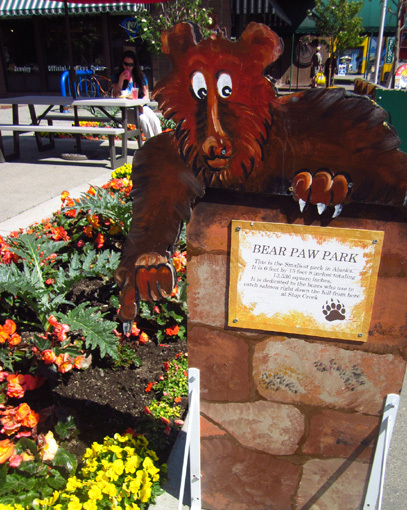 Measuring a mere 6 feet wide by 15 feet 8 inches long, it is "dedicated to the bears who used to catch salmon right down the hill from here in Ship Creek," according to the sign. People still fish for salmon in the creek but I guess the bears prefer more solitude since this area is so urbanized now. This information center is even more impressive than the Public Lands Center in Tok. There are four of these centers in the state. The other two are in Fairbanks and Ketchikan. 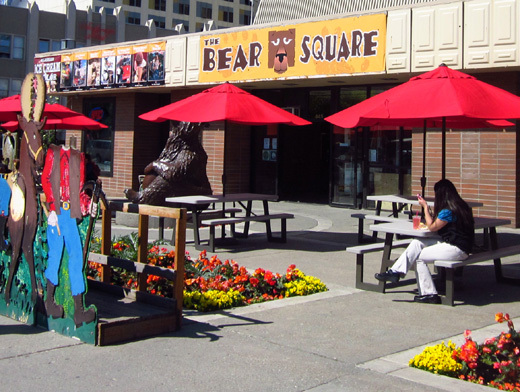 by the city to grow and maintain beds all over the metro area, especially downtown. Reindeer hot dogs! We aren't in Kansas any more, are we? Jim likes hot dogs but even he is skeptical of this version. We had to go through security to get into the APLIC part of the building on the first floor. The courtroom in the Old Federal Building is still in use sometimes. A sign near the entrance lets you know if court is in session that day. Just come prepared to go through the scanner. Jim decided to take his pocket knife back to the truck before entering so he wouldn't risk having it confiscated. 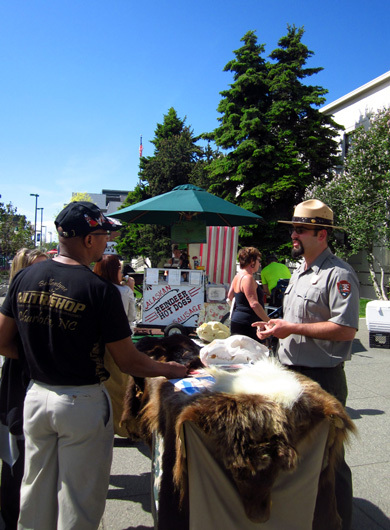 A ranger discusses bear safety with a visitor outside the Public Lands Center. We didn't stay long, however, because we didn't put much money in our parking meter. We have been warned several times that the meter readers in this busy area of town are merciless and the fines are high if your meter runs out before you return. Last evening we spent more time reading about all the things to do and see in and around Anchorage. Wow. There’s a lot that interests us and most of it is free or inexpensive, often involving only the diesel to get there and/or parking fees. The Milepost has a wealth of information. We also have the numerous free brochures and magazines we’ve picked up, Rvers' blogs, recommendations from people we’ve met, and other resources. It's overwhelming and our list of things we want to see and do is long. And this is just for the Anchorage area! The biggest problem is prioritizing that list. We'll do what we can in the time we're here and might come back again after we've explored the Kenai Peninsula. Like the rest of our trip, we'll play it by ear, primarily based on the weather. On dry days we'll get out to hike and ride our bikes. On wet days, which are coming soon, we'll do more indoor activities like visiting museums or watching films. Today was in the 60s and sunny so we got out to ride and hike this morning. 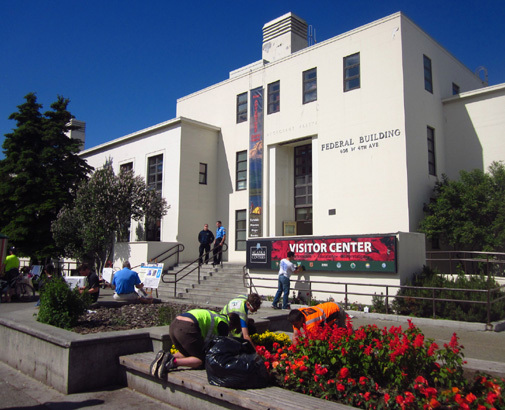 In the afternoon we went downtown again, returning first to the Alaska Public Lands Information Center. Yesterday we picked up a schedule of the APLIC's films and programs. 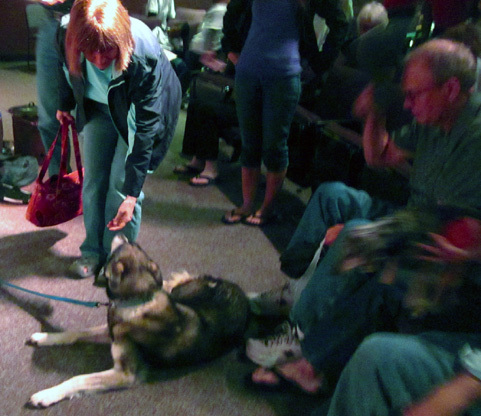 Free films about Alaska run continuously in their comfortable theater all day. A live presentation is given at 2 PM each day from Monday to Saturday in the summer and there are guided walks twice a day. Today's special program was "Dog-Mushing 101." We arrived in time to watch two films between 1 and 2 PM in the same theater as the live presentation. The next film, “Alaska’s Wild Legacy,” was only 15 minutes long. It wasn’t what we expected. It was about the controversial conservation legislation passed during Jimmy Carter’s presidency in the 1980s that set aside millions of acres of land in Alaska for protection. Miners, loggers, and some residents, including indigenous people whose ancestors had hunted and fished there for the last 14,000 years, were not happy. Both viewpoints were shown. I'm not sure how folks feel about it three decades later but I’m mostly happy the land has been preserved. There’s plenty more that can be developed/mined/logged. 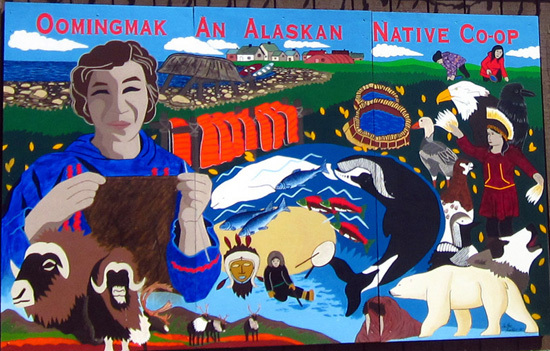 And Native Alaskans are still allowed to do subsistence hunting, fishing, and gathering in some or all of the wilderness and park areas, including Wrangell-St. Elias National Park. We're already beginning to learn about various hot-button issues up here that are new to us. 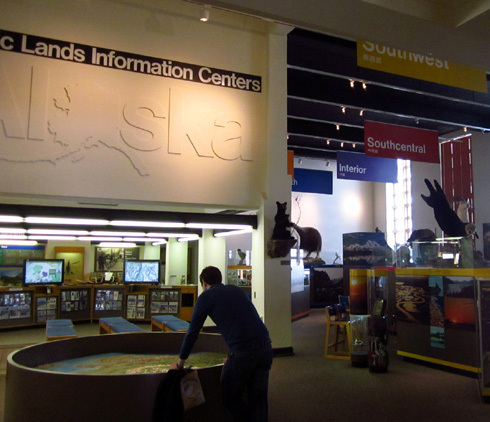 Other free films at the Public Lands Center feature bears, the 1964 earthquake, Denali National Park, and Alaska railroad history. We might come back to see some more of them. Between 2-2:40 PM we listened to a very interesting presentation by a young woman who has been a musher for the last thirteen years. She competes in distance sled-dog events like the famous Iditarod Trail race and the Serum Run to Nome. Those are about 1,000 miles long. Her husband competes in medium-distance sled dog races (50-500 miles). Sprint races are 30 miles or less. The speaker and her husband have about 43 dogs at their home in Willow, where several other mushers live. (Willow is north of Anchorage, off the George Parks Highway on the way to Denali.) About 36 of their dogs are of the age, temperament, and ability to compete. The couple has to maintain their day jobs to feed that many dogs; she said their monthly dog food bill, for the specialized high-fat and protein food the dogs require, runs them about $2,000 – even more than their mortgage payment. That doesn't include veterinary care, any dogs they need to purchase, a gazillion dog booties, sleds, other race and training paraphernalia, transportation, race fees, and other expenses associated with mushing. This is a very serious hobby! 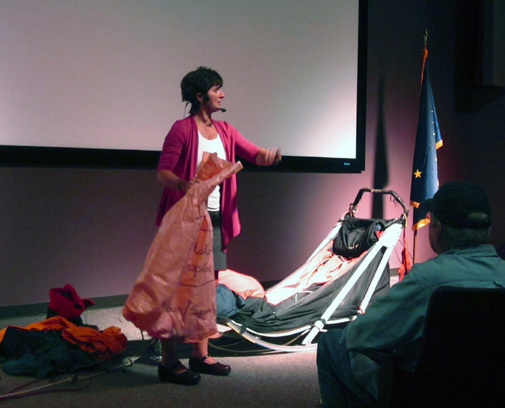 The whole talk was very interesting – she covered the desired physical and mental characteristics of the dogs, training, challenges during races, use of “drop bags” for the dogs' and musher's food and other supplies at check-points, etc. We could relate to some of that from our ultra-distance trail running/racing. At least ultra runners don't have to be responsible for a team of dogs during races, too. It’s interesting that the dogs who compete in these events are so small. 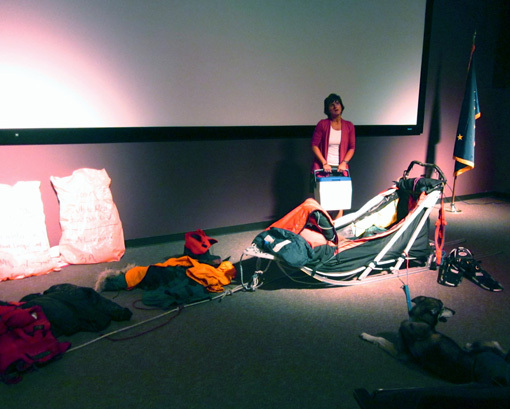 After the presentation the audience could go down to pet the dog, inspect the sled and other items the speaker brought, and ask her more questions. It was a good presentation -- and free. We recommend it. We're really enjoying learning about things like this that are fairly unique to Alaska and northern Canada (or at least not nearly as common in the Lower 48). 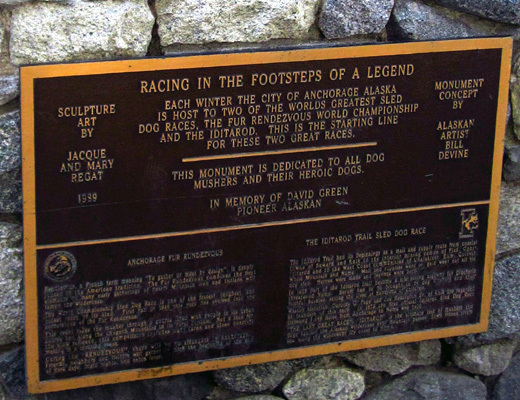 There are various sled dog kennels around the central part of Alaska that provide tours; some offer dog rides in the summer but most want their racing dogs to rest up then. 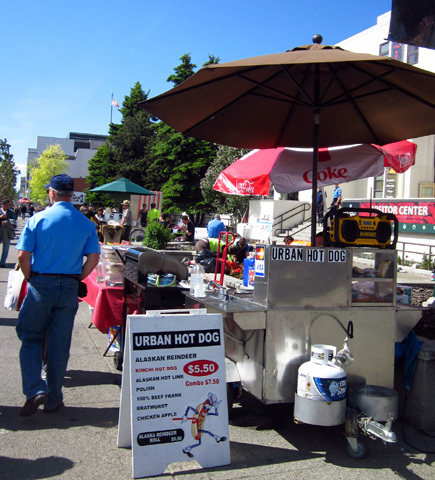 It's one way some mushers earn extra income to support their business or hobby. The only other sled dog demo I’m really interested in is the one at Denali National Park. It involves a large group of dogs and there is no charge for that presentation, either. He's the famous Siberian husky who was instrumental in leading the last leg of a team of sled dogs as fast as possible to remote Nome, AK in 1925 to deliver lifesaving serum during an outbreak of diphtheria. 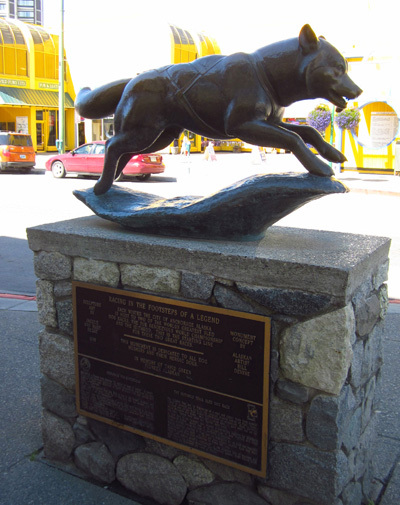 At least one of the current long-distance sled dog races in Alaska was begun in honor of that historic event. We rarely enter anything even resembling a souvenir shop or tourist trap but it was fun to walk a couple blocks on the other side of 4th Avenue on our way back to our truck this afternoon. 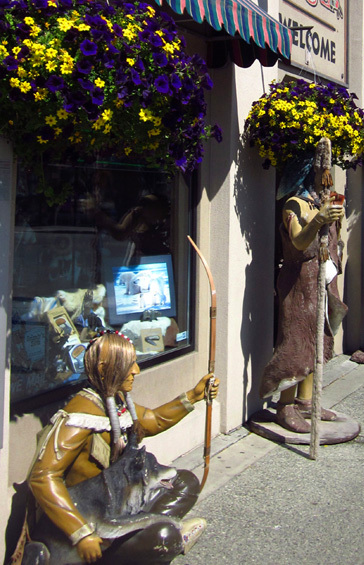 Statues of historic Native Alaskan figures outside one shop on 4th Ave. 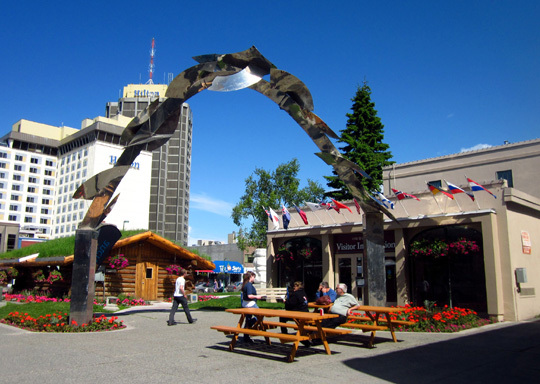 If you're into shopping for the sport of it or want to purchase items for the folks back home, there are plenty of gift shops in Anchorage (and other towns) to keep you busy. If you want something made in Alaska, be sure to look at the labels. There are many nice items that are made here, such as authentic ulu knives or carved ivory, but most of them have spawned cheap copies made elsewhere and sold by less-scrupulous vendors in Alaska. Caveat Emptor. 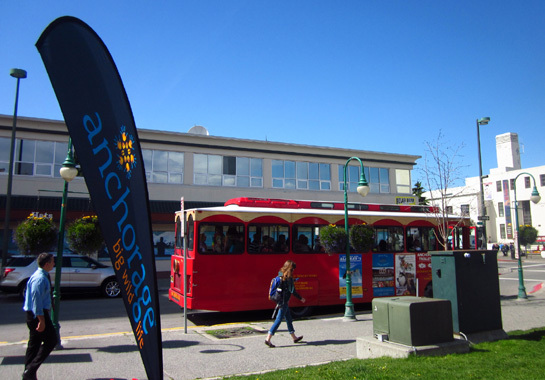 NAVIGATING DOWNTOWN ANCHORAGE: EASY PEASY! 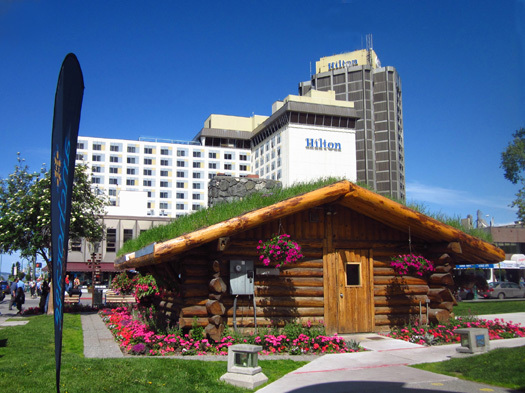 Downtown Anchorage is easy to navigate with a map or GPS. 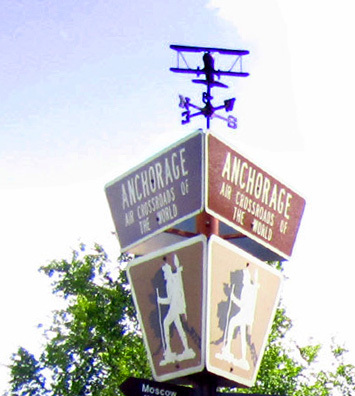 We've already got a bunch of maps of both downtown and the metro area from AAA, The Milepost, the Alaska Camping book, and the numerous brochures and travel magazines we've picked up. Numbered avenues run east to west and alphabetical streets run north to south. There are a few curved, diagonal, and one-way streets but we'll get used to those pretty quickly. 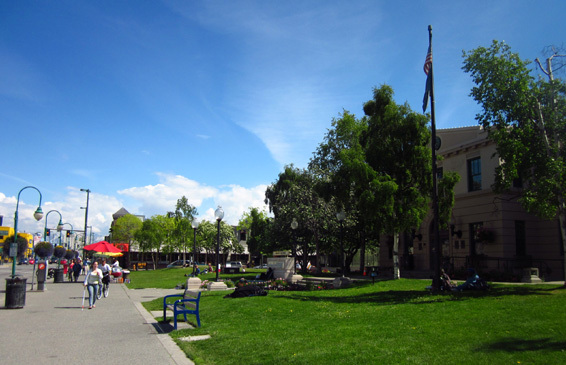 Signage is good and there are numerous parks and nicely landscaped public areas full of bright green grass and colorful flowers. It's mostly an attractive city, from what we've seen so far. 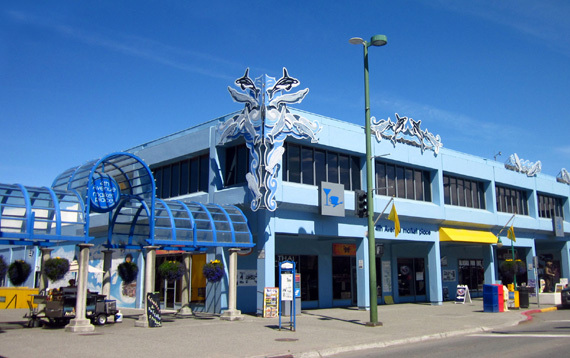 Fourth Avenue is a beehive of activity with the city visitor centers, Alaska Public Lands Information Center, grassy parks, and numerous shops and restaurants. Lots of visitors and locals gather here to see and be seen. Nearby parking is a challenge -- difficult to find, even on a weekday, expensive, and cursed with a two-hour time limit unless you park several blocks away and walk. You can't come back and put in more money after two hours; you must move to a different spot if you want to stay in the area longer, or else risk a steep fine. 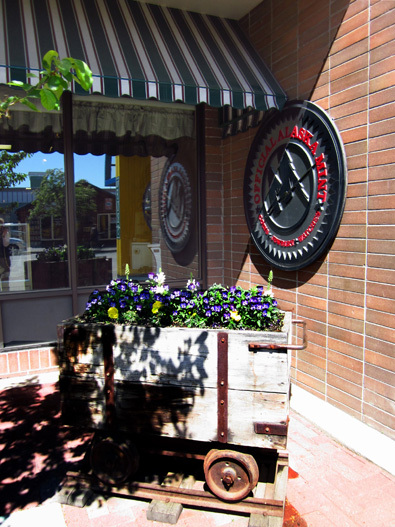 Old wooden ore cart with flowers outside a restaurant on 4th Ave.
We have been warned multiple times about the Meter Nazis who won't allow even an extra minute if you don't return to your vehicle in time. This week we lucked out and found a couple of nearby spots for which we paid dearly. Today Jim had to move to a second spot. We made darn sure we got back before our two hours were up each time. On future visits to this area we may park farther out and walk. We might also try the suggestion of a woman at one of the information centers to park at Penney's and get our ticket validated for free parking. I don't know how long you can park there. Fortunately, in much of the rest of downtown parking is easier, cheaper, and sometimes free. Remember our visit to the musk ox farm in Palmer two days ago? This afternoon we also briefly visited the Oomingmak Musk Ox Producers’ Cooperative on H Street, the only retail outlet I'm aware of for the handknit scarves, headbands, hats, and other accessories made from the exquisitely warm and soft qiviut (underwool) of the musk ox. We didn't get to see very many of the products at the farm and I was curious to see more. There's nothing subtle about the painting on the other side of the building but I like it, too. I wasn’t comfortable taking photos inside the small wooden shop (didn’t even ask). An older woman was demonstrating knitting with the soft brown fiber and a younger woman was talking to some visitors about the cooperative and its hand-knit products. I left after listening to the subtle sales pitch a little while, watching the knitter knit, and admiring the beautiful items for sale. The products are very nice but I can't justify the cost to purchase anything. 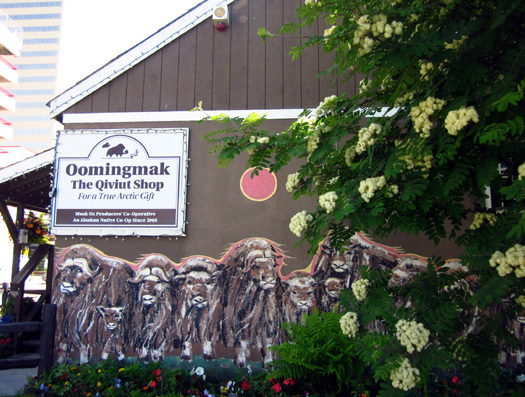 Check the Oomingmak website for prices; you can order online if you want any of the accessories but won't be visiting Anchorage. If you have the money and would like a warm hat, scarf, or other item made in Alaska, this is about as authentic as it gets! In addition to cycling, walking, and the above activities we've also checked out the downtown Post Office, driven along some other streets beyond the downtown area (not as intuitively laid out but pretty easy to navigate), found some of our favorite retail stores, stocked the refrigerator and pantry, driven through more of JBER, met some of our campground neighbors, and done four loads of laundry (free in the campground, but a hassle with several disfunctional machines). We've also taken some time to relax. It's been a busy two days and we aren't 35 any more. 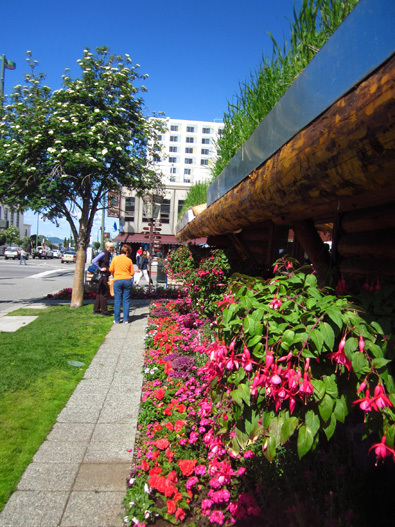 elaborate floral displays downtown. 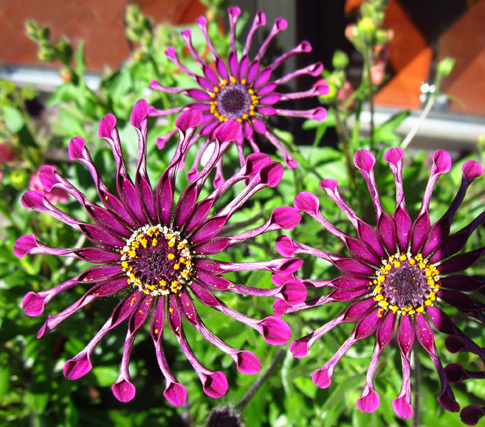 We plan to tour the city greenhouses tomorrow. The weather won't be as nice tomorrow (cooler and might rain) so we plan to visit several more places around town that interest us instead of going for a long bike ride on the Coastal Trail or hike in the mountains. There will be pictures even if it's raining!